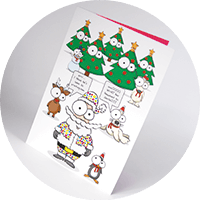 Tempted to send an ‘e-card’ instead of a printed card to your top clients? Think again. Research shows your clients will hate it. If it’s the thought that counts, they’ll think you’ve given it no thought whatsoever. 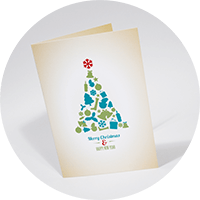 Better to send a traditional printed card, and send it early. Why send it on Christmas Eve and be on their desk for a day? Get it there for the first week of December and make the most of the month. 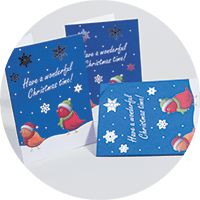 These Premium Silk Christmas Cards are our most popular – on an elegant 400gsm board and they’re seriously reduced. Ask your local printing.com for free samples of flyers, or for ideas on how they could help make your marketing more effective.